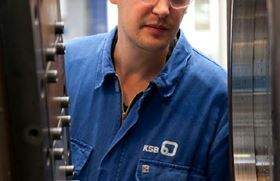 KSB is expanding its service network in the US. Image copyright © KSB SE & Co KGaA. Pump-related M&A activity between April and June 2018 included acquisitions for Annovi Reverberi, Evoqua, Hayward Industries, Idex, John Crane, KSB and Weir. The KSB Group bought the US pump service and sales company Dubric Industries Inc. The acquisition extends KSB’s service network in the highly industrial US Midwest. Based in Comstock Park, Michigan, Dubric Industries specialises in servicing and selling pumps, other rotating equipment and related spare parts. The company is now operating under the name KSB Dubric Inc. The Weir Group plc announced plans to acquire ESCO Corp, a global leader in surface mining ground engaging tools (GET), for an enterprise value of US$1.285 billion. Weir also said that it intends to sell its Flow Control business as the company focuses its portfolio on highly abrasive aftermarket-intensive applications in minerals and oil & gas markets. Portland, Oregon-headquartered ESCO is a 105 year old, family business that designs and manufactures highly engineered GET used in surface mining and construction. ESCO’s GET includes wear parts such as teeth, shrouds, adaptors, blades and locking systems that are installed on the lip systems of mission critical mining equipment. Pool pump and filter manufacturer Hayward Industries Inc bought ConnectedYard Inc, the Californian company that has developed the pHin™ Smart Water Care solution. The pHin combines a Wi-Fi-enabled smart monitor and mobile app to monitor pool and hot tub water chemistry and temperature 24/7, notifying customers via smartphone when they need to balance the water. Italy’s Annovi Reverberi Group took a 95% stake in Ace Pump Corp, a US manufacturer of pump solutions for agricultural and off-highway applications. Based in Memphis, Tennessee, Ace Pumps manufactures hydraulic motor driven, gas engine driven, PTO driven, belt driven and electric motor driven pumps for agricultural and off-highway equipment solutions. The company specialises in designing centrifugal pump solutions that operate off the electrical grid. Ace Pumps’ products are used in a variety of equipment including agricultural sprayers, asphalt milling machines, and volumetric (mix on-site) cement trucks. Mechanical seal specialist John Crane completed its purchase of Seebach GmbH, a German provider of highly engineered filtration solutions. Seebach supplies bespoke, highly engineered filtration solutions, including replacement filter elements, for critical applications in oil and gas, chemical and other mission-critical process industries. The company’s headquarters and production facility are located in Vellmar, Germany and Pune, India. Seebach will complement John Crane’s existing filtration business. John Crane moved into filtration in 2008 when parent company Smiths Group plc bought Indufil BV, a Dutch manufacturer of patented systems used for rotating equipment in the petrochemical and power sectors. Idex Corp acquired the intellectual property assets of Phantom Controls, the developer of the SAM (Scene Apparatus Manager) system. SAM is a fully automated fire pump. The system controls the entire pumping process and will alert the operator to any changes or conditions to the pumping system. Located in St Louis, Missouri, Phantom Controls will operate within the Idex Fire & Safety/Diversified segment. Evoqua Water Technologies Corp signed a definitive agreement to purchase ProAct Services Corp, a US provider of on-site water and air treatment solutions and services, from private equity firm Hammond, Kennedy, Whitney & Company Inc and members of management, for US$132 million. ProAct Services, which has annual revenues of approximately US$54 million, will expand Evoqua’s service capabilities in mobile/temporary process water and wastewater treatment, hydrostatic water treatment, and coal ash pond remediation. When the deal closes, ProAct Services will operate as a separate division within Evoqua’s Industrial Segment and will continue to be based in Ludington, Michigan. First quarter 2018 mergers and acquisitions are listed here. The main pump-related M&A deals in the first three months of 2018.